« New MacBooks & MacBook Pros? CUPERTINO, California—October 14, 2008—Apple® today unveiled the LED Cinema Display featuring a stunning 24-inch LED-backlit widescreen display with built-in iSight® video camera, mic and speakers in an elegant, thin aluminum and glass enclosure. Designed for the new MacBook® family, the LED Cinema Display includes an integrated MagSafe® charger, three USB 2.0 ports and the new Mini DisplayPort, making it easy for MacBook users to quickly connect and power their notebooks as well as use their favorite peripherals. The 24-inch glossy, widescreen display with 1920 x 1200 pixel resolution uses LED-backlit technology to provide instant full-screen brightness and great power efficiency. Suspended by an aluminum stand with an adjustable hinge that makes tilting the display almost effortless, the new display includes a built-in iSight video camera, mic and speakers, making it ideal for video conferencing with iChat®,* listening to music or watching movies. The new display also includes three self-powered USB 2.0 ports so users can simply leave their printer, camera, iPhone™ 3G or iPod® dock connected when they take their MacBook with them. The sleek, thin display also includes a built-in universal MagSafe charger so users can conveniently leave their notebook’s MagSafe power adapter in their travel bag. The new LED Cinema Display is the greenest Apple display ever, made with mercury-free LED technology, arsenic-free glass and highly recyclable materials. The LED Cinema Display meets stringent Energy Star 4.0 requirements and achieves EPEAT Gold status. ** The new display contains no brominated flame retardants, all internal cables and components are PVC-free and its foam packaging has been reduced by 44 percent. Part of the next-generation DisplayPort industry standard, the new Mini DisplayPort delivers a pure digital signal that can drive up to a 30-inch widescreen display. The Mini DisplayPort is ultra-compact at just 10 percent the size of a full DVI connector, perfect for the sleek design of the new MacBook family. Adapters are available for using the MacBook’s Mini DisplayPort with older generation VGA, DVI/HDMI and Dual-Link DVI displays. The new LED Cinema Display will be available in November through the Apple Store® (www.apple.com), Apple’s retail stores and Apple Authorized Resellers for a suggested retail price of $899 (US). 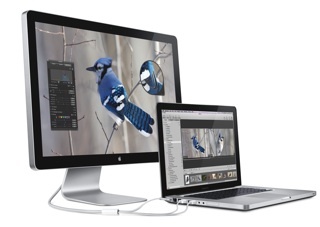 The LED Cinema Display requires a MacBook, MacBook Air™ or MacBook Pro with the new Mini DisplayPort. *Video chatting requires a broadband Internet connection; fees may apply. Sounds and looks great. Only problem is that I understand there is no connector to my 2-year old macbook. Strange that. Anyone got any suggestions?